Lexington Houses Blog: Help Sell Your Lexington Home with These Top Projects! Help Sell Your Lexington Home with These Top Projects! Selling your Lexington home can, at first glance, seem like an overwhelming process. You want to make sure to get the most return on your investment, but if you’ve been out of the Lexington Real Estate market for some time, it can be hard to know what to expect. Not only are you thinking through the financial side of things, but you’re also probably beginning to search for a new home in Lexington and thinking through how long the entire home selling process might take. Needless to say, there are a lot of things running through your mind! Having an experienced Lexington Real Estate agent by your side from the start can be key in ensuring you are successfully able to navigate selling your Lexington home. In my years of service as a real estate agent in Lexington, I enjoy providing my clients with a personalized approach to selling their home, and creating a plan that’s specific to their needs. If you’re looking for ways that you can help your home sell, I’ve listed some of the top projects that can help bring the biggest return. You’ll not only be creating a move in ready home for the buyers, but will be adding value as well! - Adding proper insulation will not only add value to your home, but will save you money. This energy efficient project will reduce up to 30% of heating and cooling costs. Those looking to buy a home in Lexington will be searching for homes that are more eco-friendly and adding insulation or even replacing old windows with new energy efficient ones will appeal to buyers. - The best way to update your home is to remove any excess furniture or knickknacks that don’t serve a purpose. Not only will this make your Lexington home appear larger, but it will give your home a more updated feel. If you’re planning on selling your home, buyers will appreciate this clean and updated look as they’ll be able to better envision their belonging in your home. - Kitchen’s are one of the top places that people will want to see upgrades and where you will get the most return on investment. The top kitchen project is to upgrade your appliances. Of course stainless steel appliances are today’s standard, so if you haven’t upgraded yet, now would be a great time to do so. Another upgrade that’s possible for those who already have stainless steel appliances are energy efficient options. Switching to these “green” appliances will cut down on your energy bill and will be better for the environment as well. - Bathrooms are another space where many will want to see upgrades. An easy way to refresh bathrooms is to change out the fixtures. From lighting to the vanity or even just the cabinetry hardware; there are many cost effective updates that can be made in a bathroom. - Give yourself more space instantly by organizing your closets and cabinets. 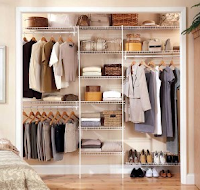 Clean out things you no longer use and consider investing in a closet or pantry organizer. This will immediately give the appearance of extra room as well as being easier to maintain. - Curb appeal speaks volumes for how you care for your Lexington home overall. A lawn that is well manicured and aesthetically pleasing will appeal to most no matter what the size. Buyers will want to know they can simply maintain the lawn you’ve cared for rather than having to put in a lot of time and money for updates. - Adding outdoor living space is like adding square footage onto your home. Imagine lounging in a new outdoor living space and hosting outdoor dinner parties this summer. This update will add value and character to your home! - Finishing your basement, while a seemingly large project, is much less expensive that adding an additional room onto your home. You’ll want to be sure to have a professional inspect your basement for its moisture level before you begin. Adding carpeting or a fresh coat of paint may be all your basement needs to gain a finished appearance. This additional living space may be just the thing for which buyers are searching. I hope these top projects inspire you to look objectively at your Lexington home and take on a few to improve the selling value of your home! If you have further questions about getting your Lexington home sold, or would like to learn more about my personalized home selling plan; please feel free to contact me today!